Australian, Berlin-based drummer-percussionist Tony Buck and Italian electric bass player Massimo Pupillo are restless musicians who are always ready to explore new sonic frontiers. 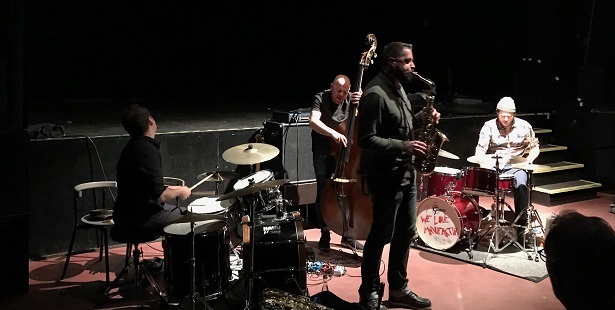 These masters of all aspects of rhythm, pulse, and groove are members of now legendary and seminal trios - Buck for more than thirty years with the Australian experimental, free-improv The Necks, and Pupillo for twenty years with the Italian power-punk-jazz trio Zu. Both are busy with many other projects. Buck works with partner Magda Mayas in the Spill duo, released a solo album (Unearth, Room40, 2017), and collaborated in recent years with Fennesz, John Butcher and Frank Gratkowski. 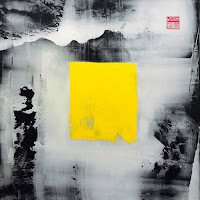 Pupillo has worked in recent years with Oren Ambarchi and Stefano Pilia, Alvin Curran and Cindytalk (aka Gordon Sharp). Time Being and Unseen are the compact vinyl and the extended, disc versions of Buck and Pupillo collaborative, haunting ambient work, recorded in Berlin on August 2017 and wrapped by the suggestive artwork by Sara d'Uva. Time Being begins with the mysterious, atmospheric soundscape of “Strange Luminant” that slowly drifts into a deep, quiet space, but is still attuned to the subtle and delicate rhythmic patterns of the electronic noises of such journey towards new sonic frontiers. The longer “Exhale” deepens the absorbing, atmospheric vein and dives into more sparse and ethereal regions. This piece produces dark, threatening tension as the ringing vibes and processed, abstract electronic sounds float in thin air but carefully envelope the unsuspecting listener. The pieces of Unseen are much longer, denser, and richer. The 22-minutes “Psithurism” offers an urgent and volatile atmosphere, constantly distracted by waves of cryptic noises. These noises produce in their turn a claustrophobic feeling, but one that is layered with slow, monotonous yet highly addictive groove that only gets more distorted, more sinister, and stronger. The 46-minutes “Entrainment” expands the disquieting, dramatic spirit, and is comprised of fast but delicate percussive noises and electronic treatments, which blend in a dark and impressionistic drone. Slowly this drone evolves into a sonic monolith with many nuanced and darker morphological layers of minimalist, delicate sounds and pulses. 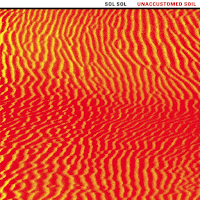 Later this drone morphs again into an intense detour into deep space of clattering, pulsating noises, adding to its dense mix of clashing pulses a new layer of distorted and mutated tough bass line, and finally drown within quiet and surprisingly peaceful, symphonic ripples. 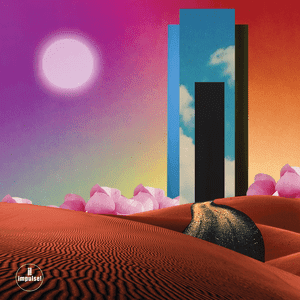 The Comet Is Coming are a UK group who have previously released on the Indie label Leaf but now make their Impulse debut with Trust In The Lifeforce Of The Deep Mystery. A band which defies genre definition, this is spiritual music, modern yet old and with more than a smattering of Mr Herman Blount. Impulse's president, Danny Bennett has said when he first heard the group he knew he was 'in the presence of greatness that was bound to shake the foundation of music. ' Label speak maybe but there is definitely something unique about this group. They fit with Verve ( Impulse's parental home) well because Verve seek to push boundaries in music - and they do. The music is co-written by the three musicians and the composition has a structured yet spiritual bent to it. King Shabaka of the band says, "We are able to catch glimpses of this life-force energy during our music-induced trances, and in doing so can contemplate our position as a human species in the context of the vastness of space and the epic scale of its workings." 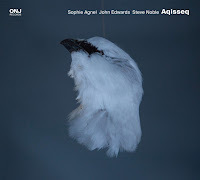 'Because The End Is Really The Beginning' is synthesised atmospherics to begin before the oft- repeated 5 note riff dominates and the percussion introduces swellings of cymbal and rhythmic under currents. All is gentle and quiet with sax adding its own melody, while the percussion increases the intricacy of rhythm, particularly under the higher notes. ' Birth Of Creation' works around a repeated theme, with synthesizer picking up the bass melody which is worked around across the track, and returned to frequently. Deeply resonant synthesiser notes emphasise the middle section, whilst the saxophone creates scaled lines in the background and the drums maintain a relentless rhythm, until the final section when sounds merge, the sax squeals its protest and a chaotic momentum with an off kilter beat from the percussion and sax is maintained to finish the track. ' 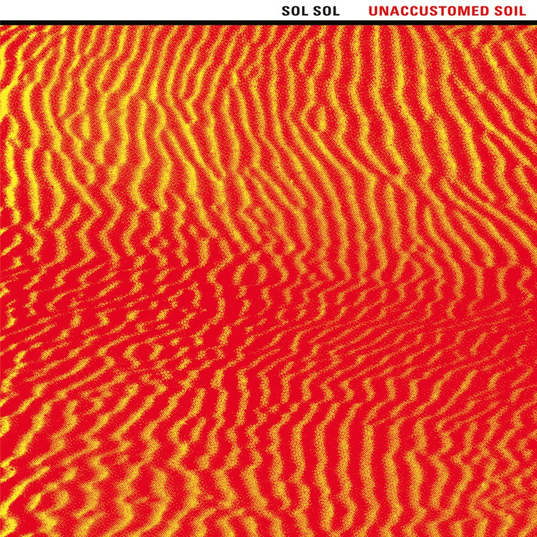 Summon The Fire' is interesting with echoed sax over double time percussion. The theme is strong, repeated again and again and the sense of speed in this track is engaging as it builds and drives forward. This is intense, high-energy, gender defying music. 'Blood Of The Past' is a pulsating, spiritual, energy encapsulating delivery with Shabakah leading on sax over a swelling and receding rhythm, the sax speaking loose-reeded and persuasive musical volumes but then is usurped by guest vocalist Kate Williams as she delivers a state-of-the-universe-address that summons up the spirits of the past and the potential mistakes of the now and future, the essence of innocence in her delivery contrasting with the mature, well honed music behind. The sax is at times unhinged in the best way and verges on the anarchic over a steady and entrancing beat pounded out by the drums. Glorious. 'Super Zodiac Comet is Coming' begins with synthesiser, soothing and blissed out before any sense of peace is destroyed gleefully by the rapidity of the rhythmic emphasis changing and the temp is upped. Suddenly we are on a hell-for-leather driving, helter skelter, chasing the vivid textures of the sax which, though repeating the riff many times, each delivery is emphasised slightly anew. Best track yet. 'The Universe Wakes Up Comet Is Coming' is a full blown narrative in itself with a slow yawning opening, a slow burning middle section with sax melodies singing over steady synthed chords before the sax goes spacial and off unto a world of its own making - beautiful riffs, short melodic plays on the key notes and finally a repeated, repeated (repeated) sequence of notes delivered at mad-cap velocity. I was not sure what to make of this album even on the second, third listen and it is difficult to say whether all the hype is justified. It is good - it is just not sure of what it wants to say. The PR notes tell you that on track 4 Kate Tempest delivers an address that evokes the 'gone-but-not-forgotten spirits of William Blake, Ian Dury, Carl Sagan and Stephen Hawking, space travelers all' - it doesn't for everyone. There is also the message their music is redolent of John Coltrane, Sanders and Alice Coltrane - not really, apart from the fact they are on the same record label now and there are some familiar essences but really, this is pure The Comet Is Coming. The vague and disjointed titles do nothing to explain the music and in many cases is hard to relate to at all. However, what this is, is original and they should go with that. There is here a divine combination of spirit-led imaginings with superb musicianship and for this alone, the album is worth everything. It is great to hear them not adhering to any genre entirely but introducing elements of African, Latin and classic jazz beats. The music is predictable to the extent that there is scaffolding of oft-repeated riffs and melodies but it is how they alter the delivery and build around the framework which is impressive. The originality is great and the music is superb, the sax driving and completely engaging whilst the percussion and synthesiser control and create guidelines ( actual musical ones). This is interesting - and at times, quite beautiful. 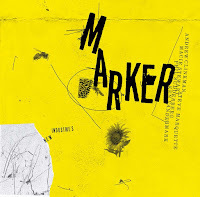 Personnel: King Shabaka ( Shabaka Hutchings) : saxophones; Danalogue (Dan Leavers): keys/synth; Betamax ( Max Hallett) : drums; Kate Tempest: spoken word on track 4. We’ve covered composer and clarinetist John McCowen’s Solo Contra and 4 Chairs in Three Dimensions, noting his awe-inspiring approach to multiphonics, dimensionality, and resonance with the clarinet family. 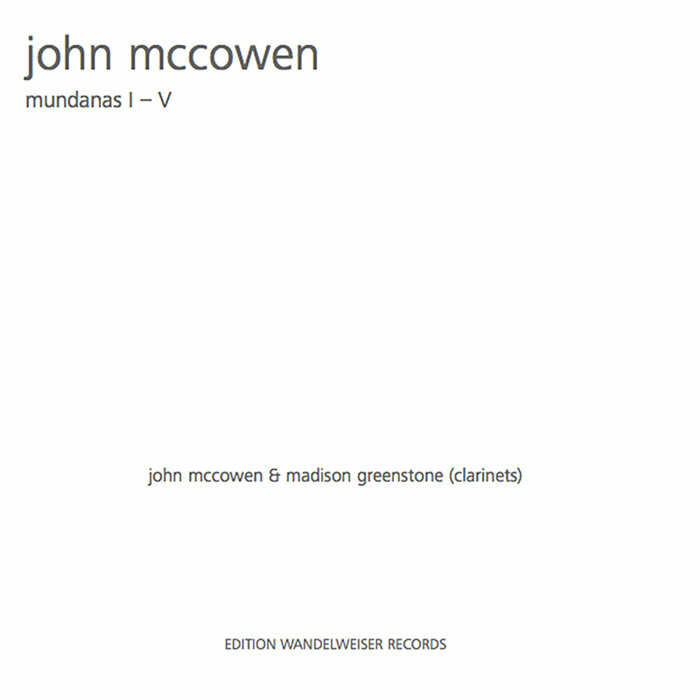 Mundanas I-V is five compositions for two clarinets that further explore those elements, performed by McCowen and Madison Greenstone across 33 minutes. Greenstone is a promising, newer voice that appears to mostly dwell around the sphere of avant-garde classical performance for the moment and can also be heard on Morgan Evans-Weiler & Michael Pisaro’s Lines And Tracings. McCowen has doubled down on his multi-faceted mode before, with the sublime Clarinet Quartets nos. 1 & 2, which is more traditionally, beautifully musical but seems less skilled in technical performance and extended technique as well as sound engineering than this recording - it feels as if what two could do in the quartet is done by one in this duo. 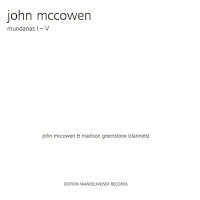 Additionally, McCowen has recorded a “Mundana no. 2,” appearing on HUMANA/MUNDANA, but this is a separate solo composition that is not the “Mundana II” intended for duo performance found on this recording. The word mundana refers to Boethius’ De institutione musica, in which the Roman philosopher outlined musica instrumentalis, musica humanas, and musica mundanas. Instrumentalis refers to music as we know it, from both tools and the voice. Humanas is the unheard harmonious spiritual vibrations between people. Mundanas is the inaudible vibrations and resonances of the natural world. It makes sense then that the complex close-mic’ing to capture otherwise unheard vibrations and resonances of a vessel with wind blown through it might be closer to mundanas than instrumentalis. And this duo might be closer to two trees communicating through a mycorrhizal network than two musicians improvising with each other. Much of “Mundana I” and “Mundana V” sounds like sine waves shifting in and out of sync, amplifying and resonating, like staring at a ceiling fan in and out of focus; this is cut by multiphonic, tense, glassy purrs that also phase in and out with each other. They are both multi-tiered, complex commentary on counterpoint and harmony, as every composition here seems. “Mundana II” switches out the synthesizer-like sound waves for an alien melody and “Mundana IV” is exotic bird calls and responses and warbles and gurgling. 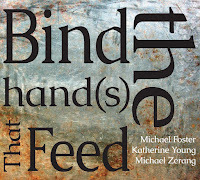 “Mundana III” is contrasted against the drones and dense sonic spaces of the other pieces by utilizing pronounced rests, silence, though every piece is so quiet that the steady streams of circular breathing and key clicks are part of the music. It’s more cognitive than body music, but it’s deeply resonated with my spirit. Absolutely enchanting. Mundanas I-V is available digitally and on CD. 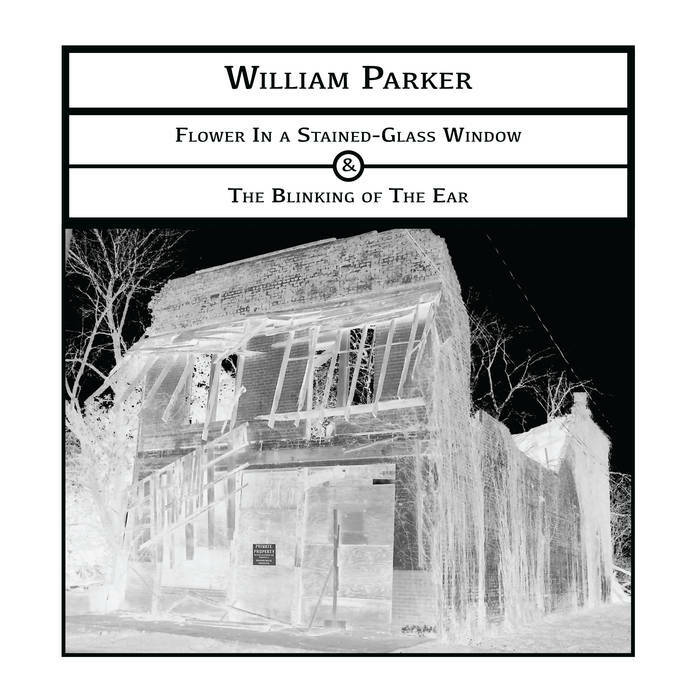 William Parker is a composer and bassist of incomparable skill. (OK, that may sound either self-evident or trite, but the accolade fits.) When he releases a new album – especially one of the many boxed-sets that he has been producing lately – I am always tempted to listen. I am never disappointed. 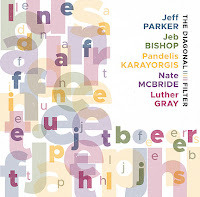 To reference a brief conversation in the comments section of an earlier post , Parker ranks among Hamid Drake and Joe McPhee as one of the most soulful artists in free jazz today. And, much like those two musicians, his music is somehow always a welcomed surprise, whether because it is so innovative, or just because it is so damn good. This double album is fittingly a departure from his previous efforts. At the same time, however, it fits beautifully into his oeuvre. Moreover, it is laden with soul, albeit in differing articulations. The first disc, Flowers in a Stained Glass Window features Steve Swell on trombone, Abrahama Mennen on tenor sax, Isaiah Parker on piano, Kesivan Naidoo on drums, Dave Sewelson and Nick Lyons on alto sax, William Parker on bass and drums, and the inimitable Leena Conquest on vocals. 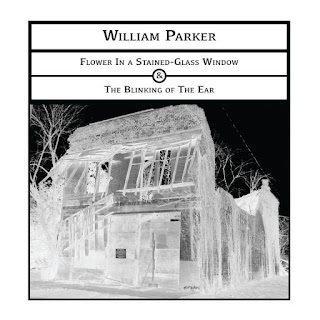 As much as Parker’s presence, both in composition and playing, make this recording the unique object that it is, Conquest’s vocalizing of Parker’s poems lends Flowers its potency. (NB: I am not always a fan of Parker’s poetry, at least when written. These words, however, work perfectly in this context.) Composed in homage to Martin Luther King, Jr., these tracks examine the history of race relations, war and peace, capitalism and democracy, and the myriad shortcomings in the contemporary quest for justice and equality. The music is powerful and Parker and his band are in top form. Conquest, however, plays a singular role. Even when quiet, she makes Parker’s words resonate throughout the mournful and hopeful improvisations that follow. 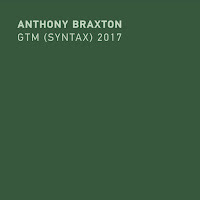 This disc consists of a satisfying balance of shorter pieces - including a particularly moving wherein the name of “Emmet Till” is repeated over a discordant tapestry of wailing horns and eerily calm bass and piano progressions – and longer instrumental tracks bookended by poetry. 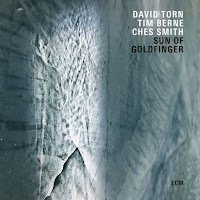 For their part, “Children” and “What is That About?,” resemble Parker’s Inside Songs of Curtis Mayfield project in their energy, melodicism, and emotive effect. One of the most surprising standouts is “I Had a Dream Last Night,” a longer, bluesy, borderline imagist meditation on a dream about a feminine Jesus’s second coming in the present day, backed only by rhythmic claps and what sounds like tambourine. The second disc, The Blinking of the Ear, takes a completely different tack. Along with long-time collaborators such as Daniel Carter (trumpet and saxes), Steve Swell (trombone), and Eri Yamamoto (piano) and a newer musical comrade, Leonid Galaganov (drums), The Blinking of the Ear also features the mezzo-soprano AnneMarie Sandy. This produces an unconventional marriage of downtown jazz and classical that affirms the classicality of the former and emphasizes the spirituality and continued poignancy of the latter. Parker himself dubs this the achievement of “universality tonality.” I find this description quite appropriate. In “Meditation on Freedom,” Sandy makes her first, unannounced but absolutely gripping entrance just over six minutes into a driving post-bop track. Her first words, “freedom, freedom, freedom,” unlock a meditation that had hitherto been entrancing, but meandering. The rhythm then slows; the melodies elide and quiet. The track takes shape as the groove slows and continues, without Sandy. 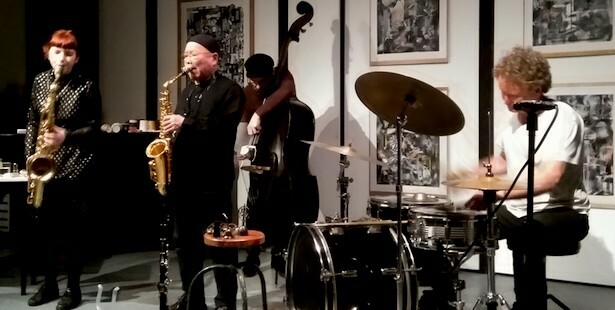 The next track, “Without Love Everything will fail,” begins with Sandy and Yamamoto, soon accompanied by Parker, Swell, Galaganov, and, eventually, Carter on trumpet. Melodies float on, along, and through each other in a soothing but irregular interweave. “Dark Remembrance” begins as a hymn with the plea, ”Lift my soul up into my heavenly, heavenly home.” Several minutes in, the lyrics take a jarring turn to describe a lynching. 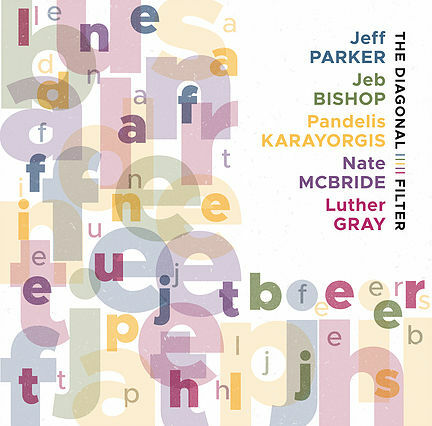 The melody, progression, and description evoke an abstracted “Strange Fruit” and, in the process, draw an unsettling connection between the past and present, and provocative links between blues and classical traditions. The two-part “Heavenly Home Meditation on Peace,” however, is the heart of this album. 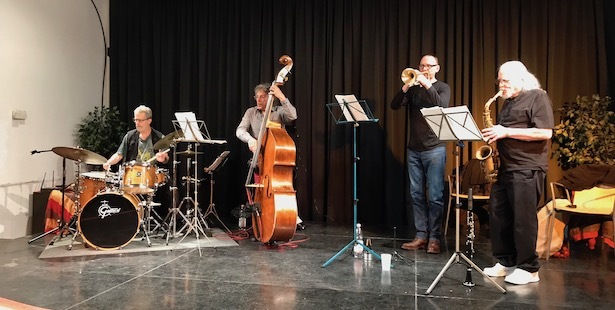 These pieces sound at times Ellingtonian and composed, at others dark and Weberian, at others liked a pared-down Mahler, at still others lyrical and post-bop or abstract collective improvisation. (For the latter, think of a less groove-driven, progressive Double Sunrise over Neptune or a lost companion to For Those Who are Still .) This, however, is hardly a hodge-podge of musical forms. Instead, each element is cleanly integrated into an effective, narrative whole. Regardless of the moment’s inspiration, the pieces are bound by an arc of moods, textures, and feel that is utterly compelling. This, of course, is not Parker’s first attempt at grand scale compositions. His experience and vision, as well as those of his fellow musicians and the stunning Sandy, shine. When thinking about Marion Brown and Dave Burrell, I rarely gravitate to anything of this period. In fact, there isn't much of it even recorded or issued; compared to the fire music of the 60s. So, my lack of listening experience with this musical period resulted in mixed emotions, mainly excitement and worry that it would not live up to my expectations for these artists. Dave Burrell has always served as a very capable sideman, and his leading role on the BYG actuel released album Echo was where I first became engulfed into his skillful musicianship. Echo is a large outing with some of most well-known and respected names in free jazz at the time, and it really is no surprise that the album is quite difficult to get into. The musical partnership between Burrell and Brown was revealed to me through some of Brown's first releases, including Juba-Lee and Three for Shepp. While their previous musical partnerships had been rewarding and unique, I never saw their connection at a level of say that between Coltrane and Tyner. 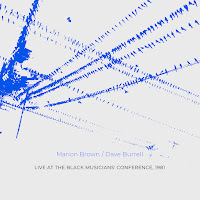 I’m glad that this performance displays the closer and more dynamic sides of Burrell and Brown, isolating them from other musicians’ input of ideas. While their relationship is not completely equal, I believe it’s important that the playing not be so leveled out. Having music contain various dynamics and narratives makes it much more interesting and democratic. Even if it can sometimes be individualistic in what directions are taken, there’s a clear sense of collaboration and conciseness in the music. The setting itself seems to be very intimate, a respectful crowd and varied set list makes this performance a standout in the catalogs of both artists. A couple pieces composed by Brown, three by Burrell, and interestingly enough, two Billy Strayhorn covers. I noticed that there was a tendency for the composer of their respective pieces to be the leader as well, guiding the other musician by setting a well-crafted stage to jump off. The recording quality can be shoddy at times, but never gets in the way of the emotional outpour that this album is able to muster up. Brown and Burrell have gone past their fiery walls of sounds that was sometimes present in their earliest recordings. The passion in Brown's playing cuts through from the first few seconds of the opening track, "Gossip / Fortunado", and continues throughout the rest of the near eighty minute performance. Each note blown is carefully chosen and carries a great weight with it; Marion Brown shows that even in his middle ages he is able to push forward and successfully play "in" and "out" of the pocket. A lot of these songs are in the ballad vein with a clear soulful and bluesy influence. Brown is the elder statesman, showing off his experience while staying true to the tradition. Most of the tunes end up having a clear melodic theme that is easily hummed and remained in my head throughout the day, and while he goes on during his fluid outward playing, Burrell keeps that theme in check for when it's time to come home. 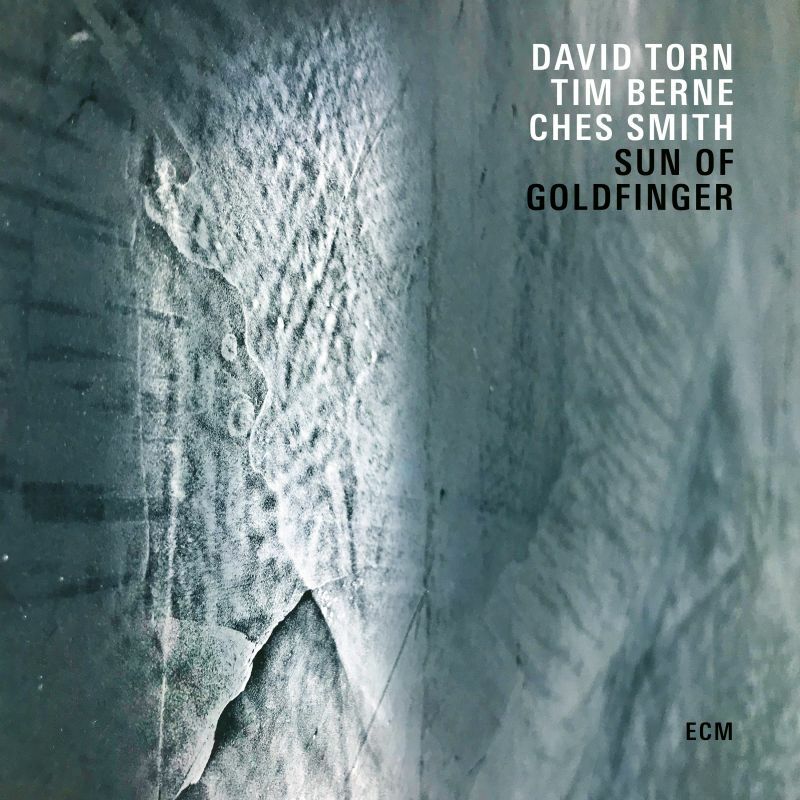 Dave Burrell is much more on the conservative side for the majority of this album, with his compositions taking on a noir atmosphere, without any of the perceived pretentiousness that may accompany such a description. One of the beautiful aspects of Burrell's playing is the diversity he maintains within it. 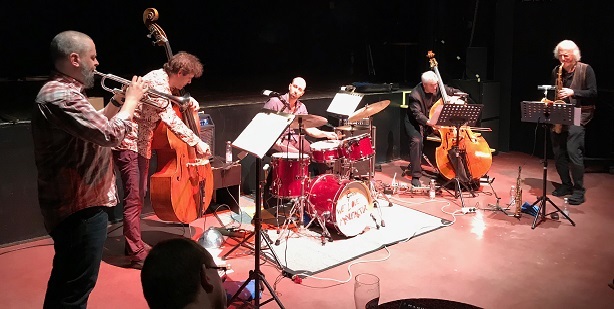 Whether it be the early swingers, or Lennie Tristano and Cecil Taylor; Burrell can establish himself using the variety of the jazz world around him. In this recording he leans on his more traditional learning, taking Brown along with him for the ride. All three of his compositions play one after the other, these being "Punaluu Peter", "Pua Mae 'Ole", and "Crucifacado". These three songs grant a change in pace that is not only interesting but comforting, like meeting a long-lost friend. On the flip side, the weakest portions of this performance are within the two Billy Strayhorn covers, "My Little Brown Rock" and "Lush Life". There's some interesting moments and it stays very warm and true to form, yet it loses some of its memorability and impact on me. Even though these couple of tracks cut through the flow of what's going on, their inclusion provides a look inside the unbothered and loving minds of these two free jazz giants. This album has taught me a couple things; first, that I should be on the lookout for more recordings of piano and saxophone duos (a couple of my favorite instruments) and second, to explore and enjoy the later works of jazz musicians. This may be a great place to start within the discography of these two artists, as it mostly increases in intensity the further back you dig. The interplay between them is strong, yet kind and gentle. Brown and Burrell show a definite sense of respect and restraint around each other; their decades of working together accumulate here to create something truly wholesome and gorgeous. Those at UMass Amherst were lucky to able to witness such a musical partnership, and although it only reaches us now through this imperfect recording, this album still feels like a surprise gift that you never knew you wanted. There's a sentimentality in the playing that becomes more familiar as the music progresses, especially if you're already familiar with the music of these artists. This may not be my go-to album for these artists, but it serves as a great reminder of what they're capable of and how well they aged during their tenures as some of the world's greatest musicians. Bassist Anthony Shadduck’s new album presents itself with a kind of low-key humility. Aside from the nod to Free Jazz in the title, there’s a straightforwardness to the album that belies the depth of cleverness and delight hidden within. Of course, my “local boy makes good” spin on this album, recorded at and released by Long Beach’s own Big Ego, might be seen as a brag (only a bit), but I’m always keeping my eye on the SoCal scene, which is filled with magnificent players. The first half, recorded with a first-rate quartet, features three covers (by Ornette Coleman, Paul Motian, and Chris Schlarb) and one original. On the opener, Coleman’s “Law Years,” Shadduck pairs pianist Cathlene Pineda and guitarist Jeff Parker on a radical re-voicing, doubling chords where Coleman often removed them completely. The group slows the tempo and lowers the fever, but Pineda and Parker are dynamite improvisers. 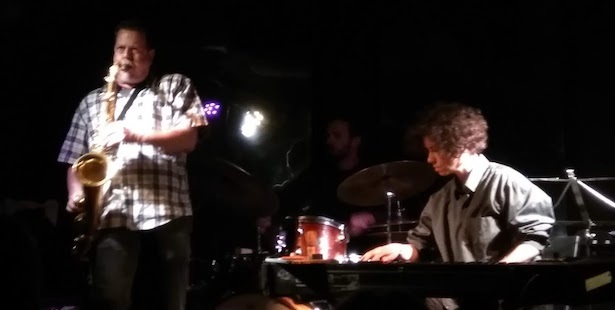 Where Shadduck seems to be channeling Charlie Haden, Pineda provides a Don Pullen or Anthony Davis–like voicing, with drummer Dylan Ryan at times channeling Bobby Battle. If it sounds like this quartet is a loving callback to 1980s DIW and Black Saint/Soul Note sessions, that seems to be what’s happening here (which is meant as a compliment, naturally). On the flip side, a double quartet goes full tilt on a pair of uptempo swingers. The lineup has Shadduck and David Tranchina on bass, Danny Frankel and Chad Taylor on drums, Alex Sadnik and Phillip Greenlief on woodwinds, and Kris Tiner and Danny Levin on brass. Shadduck has the writing credit for “One” and “Two,” but, as with side one, it’s his subtle direction on the improvisations that gives the pieces their structure. The tracks are brisk, totaling 20 minutes, but there is room enough for each player to take centerstage. And really, that’s the most notable element. Shadduck’s been leading a Ornette-inspired double quartets for nearly a decade , so he has a clear vision for how to arrange and balance these groups. 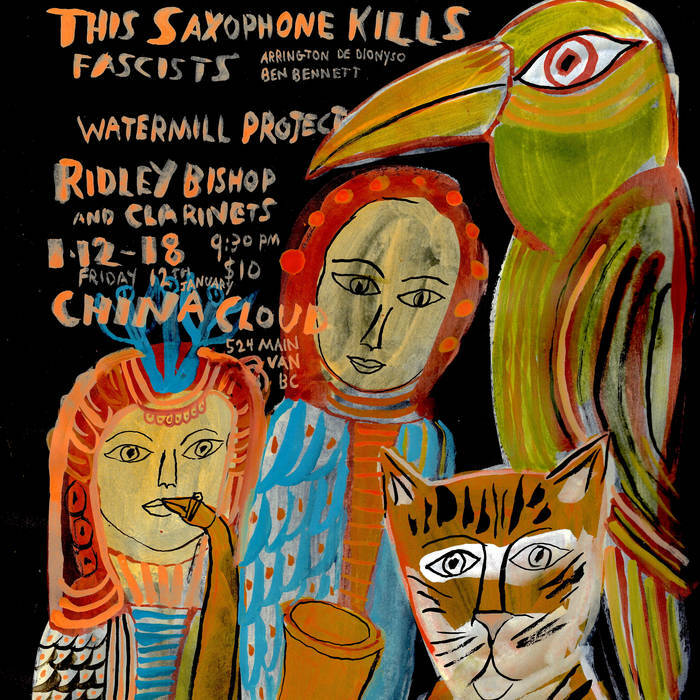 I first came across Arrington De Dionyso not through his jazz-punk group Old Time Relijun, but through his visual art. And became obsessed with it. Arrington’s artworks chanels raw energy, sexual freedom and transcends a vision of a society (especially not the modern version of it) free of hatred and most of the –isms. Like racism and fascism. His music – be it free jazz, trance music from Eastern Asia or solo vocal blowouts – is the audio equivalent of his visual art. Ben Bennett is a below the radar drummer/percussionist who is gradually building a high quality discography partnering with important musicians like Michael Foster (another man who is working below the radar) and the great Jack Wright. I especially suggest his solo album from 2012, Spoilage. This live recording comes from early 2018 at China Cloud venue in Vancouver, Canada. 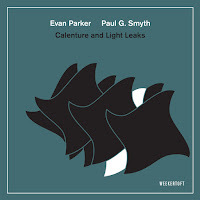 While it is certainly a high energy free jazz duo, it also encapsulates both musicians’ assets. 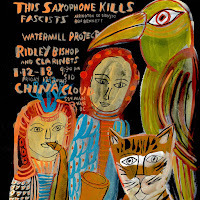 Arrington is on tenor sax, bass clarinet, bromiophone and vocalisations and Bennett on drums and percussion. Right on I must admit that the quality of the music, plus the recording’s, is so high, that it’s a great pity few will listen. All of you interested you can listen to the recording through Arrington’s bandcamp. As for the music itself, it never ceases to impress the listener. Every moment of the little more than 40 minutes recording is worth listening intensely. Their work as a duo sees them react to the challenges they face and overcoming them easily. It’s a high energy affair that both musicians add up to this energy flow while the two tracks evolve. They are in high form to say the least. De Dionyso’s playing seems focused on the audio colors he produces. From reeds playing up to his raga style vocalizations, he ensures that the organic flow of his vision never stops. Bennett’s playing is impeccable. He uses everything he can use on the drums, sometimes he leads, at some points he is laid back to ensure there’s time and space for Arrington. He seems that he is filling every inch of the venue’s space with his polyrhythm. 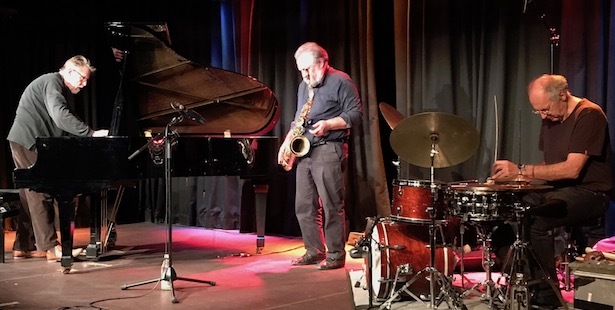 Amazing even to someone’s untrained ears…The constant flow of sounds, notes, on the spot improvisations and short timed blowouts is a pure joy, a listening that will free your mind and brings solace to your soul from normality’s small atrocities.